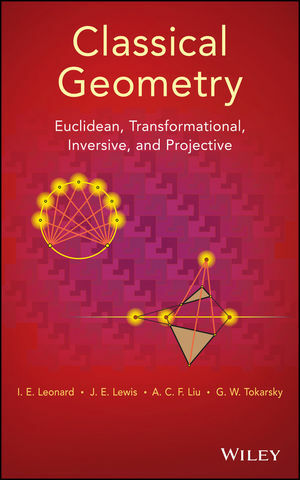 Accessible and reader-friendly, Classical Geometry: Euclidean, Transformational, Inversive, and Projective introduces readers to a valuable discipline that is crucial to understanding bothspatial relationships and logical reasoning. Focusing on the development of geometric intuitionwhile avoiding the axiomatic method, a problem solving approach is encouraged throughout. The book is an excellent textbook for courses in introductory geometry, elementary geometry, modern geometry, and history of mathematics at the undergraduate level for mathematics majors, as well as for engineering and secondary education majors. The book is also ideal for anyone who would like to learn the various applications of elementary geometry. I. E. LEONARD, PHD, is Lecturer in the Department of Mathematical and Statistical Sciences at the University of Alberta, Canada. The author of over fifteen journal articles, his areas of research interest include real analysis and discrete mathematics. J. E. LEWIS, PHD, is Professor Emeritus in the Department of Mathematical Sciences at the University of Alberta, Canada. He was the recipient of the Faculty of Science Award for Excellence in Teaching in 2004. A. C. F. LIU, PHD, is Professor in the Department of Mathematical and Statistical Sciences at the University of Alberta, Canada. He has authored over thirty journal articles. G. W. TOKARSKY, MSC, is Faculty Lecturer in the Department of Mathematical and Statistical Sciences at the University of Alberta, Canada. His areas of research interest include polygonal billiards and symbolic logic.